Always get to the bus station early if you’re travelling in Laos; if not you’ll end up squashed into a fold-out isle seat amongst bags of rice, backpacks and live chickens. 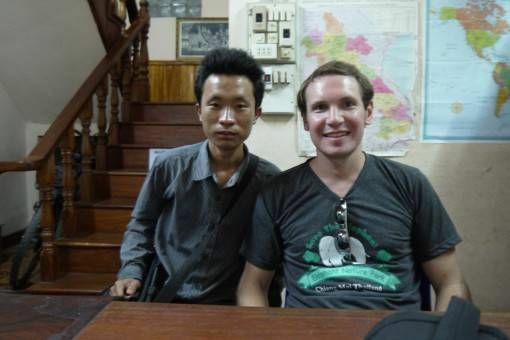 On the nine-hour bus journey to Luang Prabang I found myself wedged into a single seat above the wheel, my legs cramped into an uncomfortably raised position while the giant German man next to me kept falling asleep, his head periodically whacking my shoulder. Despite the fact that I was sore, headachey and extremely fed-up by the time we finally arrived in Luang Prabang, I felt a huge smile spread across my face as I took in my first views of the city. 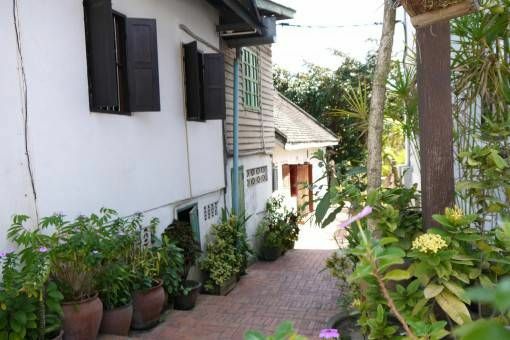 As we whizzed through the wide streets lined with flowering trees I marvelled at all the ancient French colonial buildings decorated in pastel shades with wooden shutters. Next our tuk-tuk turned and sped along the river-side; giving us a glimpse of the tree-covered mountains beyond, before fighting its way through the centre of the city and the early-evening bustle of locals setting out their market stalls while tourists sat, nonchalantly sipping beer outside cafes. As we were deposited in front of a row of guesthouses I knew the torturous journey had been worth it – I was already in love with Luang Prabang. I can count on one hand the amount of places I’ve fallen instantly in love with since we started our trip – Luang Prabang is one of them. Despite the fact that our time in the city was fraught with personal problems and illness for Andrew, there was just something about the vibe that kept us there much longer than planned. Discovering places like Luang Prabang is what ultimately keeps me travelling; you never know when you’re going to stumble upon somewhere that you connect with so completely and when that happens, it’s pretty incredible. 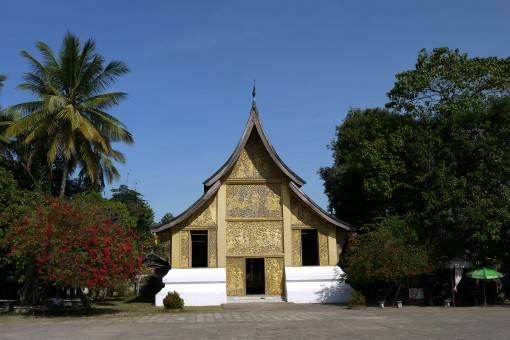 Recognised as a UNESCO World Heritage Site, Luang Prabang is a beautiful city, especially by Asian standards. It’s green and leafy, relatively clean and unpolluted and planted right in the middle of mountainous countryside in between two rivers. 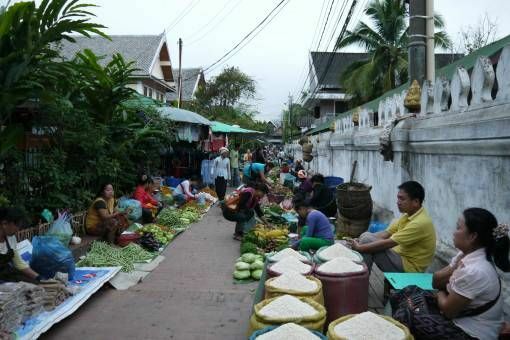 Although the city has a distinctly European feel derived from its French colonial history (which is visible in its architecture, bilingual schools and abundance of French bakeries), the city is also unmistakeably Asian with its sparkling Buddhist temples, colourful tuk tuks and orange-robed monks. Typical of laid-back Laos, the people in Luang Prabang are relaxed and friendly; naps and babysitting duties taking priority over work. 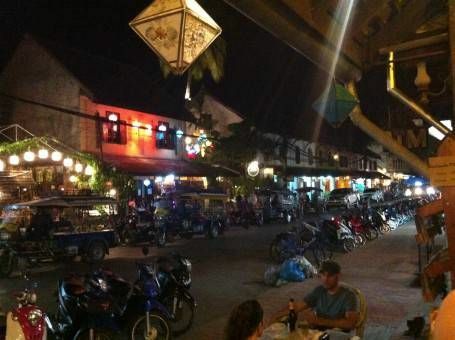 During our time there we settled into a routine of working and relaxing in cafes during the day, exploring the city’s temples, markets and side-streets and taking trips out to the surrounding countryside and waterfalls. 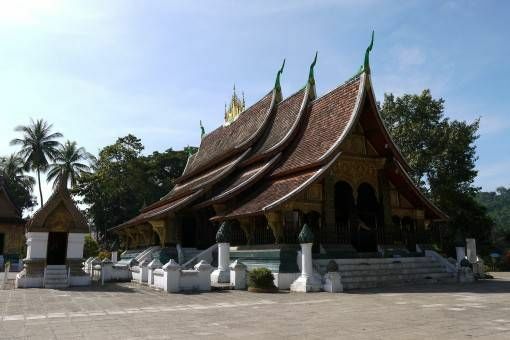 The weather in Luang Prabang was perfect when we visited at the beginning of our trip with brutally-clear blue skies and white-hot sunshine, while our return at the end of the month was marked by greyer, cooler weather. 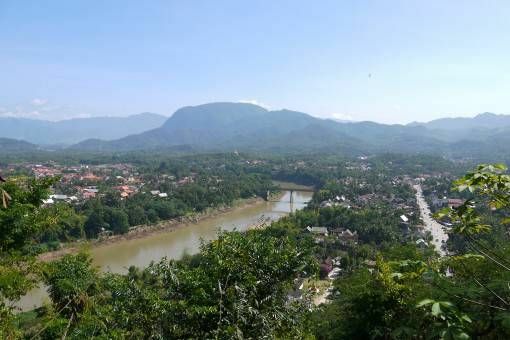 You can spot Mount Phousi from most parts of Luang Prabang; the tall mountain is topped with a golden temple and provides incredible views of the city and surrounding countryside. 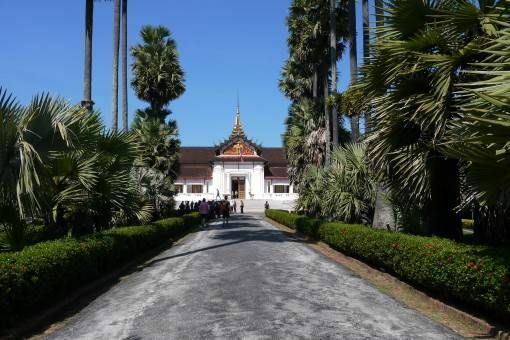 The hill is accessed from the heart of Luang Prabang opposite the palace; simply climb the 300 steps to the top and prepare to be amazed by the view. This is the most impressive temple complex we saw in Laos. The day we visited the sun was blisteringly hot and the glass tiles and golden statues were almost blindingly beautiful because of it. This is basically the former royal palace, which has been preserved in its old inhabited state. I didn’t find the visit particularly riveting but I’d say it was worth a look; there was also a display of royal cars outside and a really interesting Floating Buddha photo exhibition. 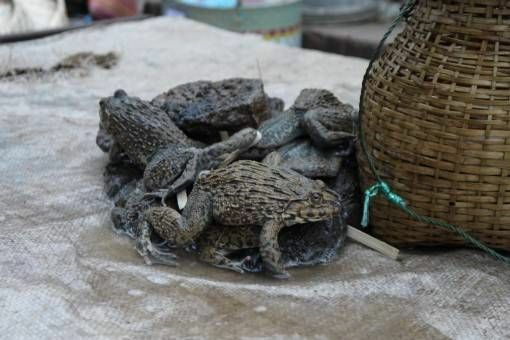 If you’re up early take a look around the morning market, as well as colourful fruit and vegetables you’ll see plenty of more ‘exotic’ goods on sale: live toads and ducks, dead snakes with their skin still on and all kinds of fish. We took a tuk tuk out to Kuang Si with some other tourists and it cost just £6 return for the two of us. We’ve seen plenty of incredible waterfalls on our trip so far but I think Kuang Si wins hands-down with its spectacular main drop and topaz pools set amid lush jungle. Although the water was absolutely freezing we had fun trekking up to see the different levels and watching people playing on the rope swings. There’s also a bear sanctuary at the entrance to the waterfall which is a nice bonus. If you go to Luang Prabang make sure you visit Big Brother Mouse, an organisation that publishes children’s books and encourages tourists to buy and distribute them in rural areas. Literacy levels are shocking in Laos and many children have never even owned a book; as a voracious reader, I can’t remember a time in my life when I didn’t have at least one book on the go, so I find this fact incredibly sad. We dropped into Big Brother Mouse to buy some books and ended up taking part in the English conversation practice sessions held every day between five and seven pm. The young people we spoke to were so eager to learn and chat with us, asking us to explain the meanings of certain phrases or requesting help with their pronunciation. It was interesting swapping tales of life back in England with theirs in Laos and I think we learned as much from the experience as they did. 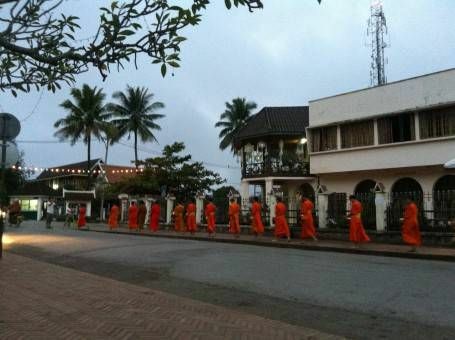 Luang Prabang is also famous for its daily alms giving ceremony, whereby hundreds of monks from nearby monasteries parade the streets at dawn collecting offerings from local people. 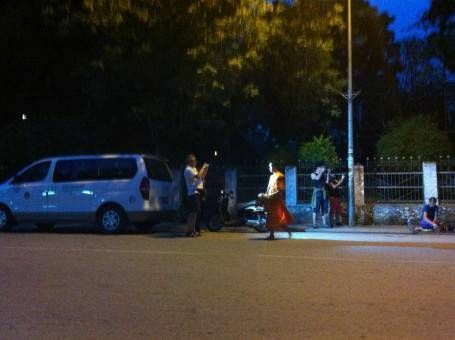 Sadly, although there are plenty of signs around town advising tourists how to behave during the ritual, we witnessed plenty of disrespectful tourists, often dressed inappropriately, snapping pictures in monks’ faces and getting in the way of the procession – more about this to come in my next post about bad tourism. I love when you’ve just had the most awful, grueling travel day only to alight from the bus/train/chicken truck/etc to find yourself in a place you immediately love. There’s really nothing like finding yourself head over heels for a place, but somehow the harder they are to reach, the harder we seem to fall, no? 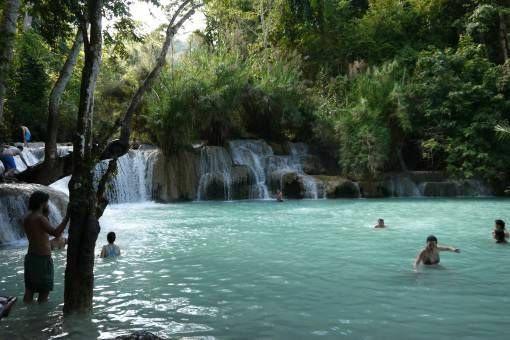 Luang Prabang really does look lovely. As you say, it’s so rare to be able to say that about an Asian city! True Steph, it often is the harder to reach places we love too! Luang Prabang is lovely, it would be a great place to settle for a month or so and work too; I hope we make it back there one day! 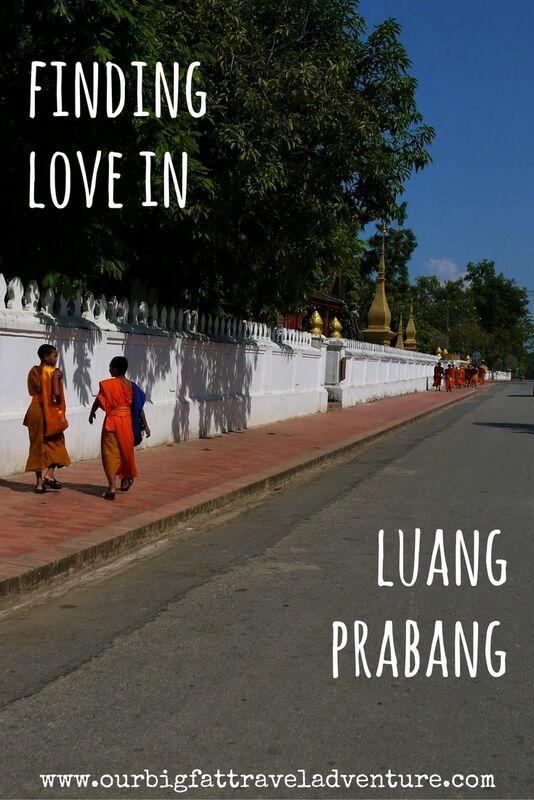 I enjoyed reading about Luang Prabang, especially since we are getting closer to SE Asia. We will definitely have to put tis on our must see list. Did you guys swing on the rope swings and get into the water? This looks like a place my daughter would love. You should definitely check it out when you get to Asia Kerri; Sydney would love the waterfall. The water was absolutely freezing when we were there though so we were only brave enough for a quick dip! How satisfying is it when you really connect with a place? It’s so rare and there are so many variables involved, but sometimes it all just clicks into place. 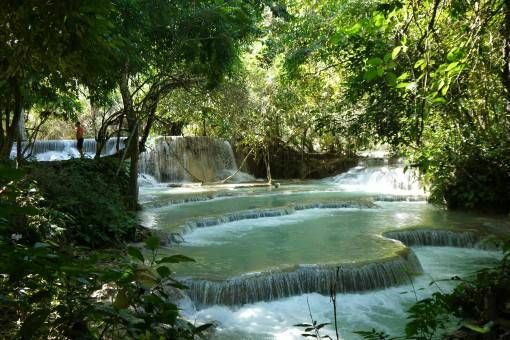 Yep, it is rare and incredible Rob; even looking at the pictures now I’m stunned by how beautiful Luang Prabang is!